The WordPress widgets feature in Genesis are most popular among with Designers and developers not because it is easy to use but the way you can control and customize is incredible, faster and is super simple. 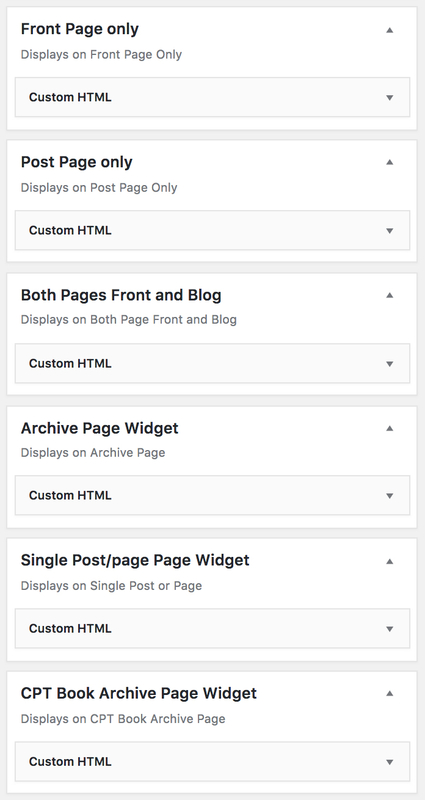 The conditional Tags in WordPress on Genesis makes it more flexible and changed the way one can manage widgets the way he wants. We have recently talked about showing widgets on the front page and home page. Today we are going with more details and customization options we can include in a site. Make sure to read to show a simple widget in Genesis. This will give you an idea how the conditional tags work with Widgets. I prefer to use two methods to show Widgets conditionally in Genesis site. The recommended Plugin is Blox. Plugins like BloxWP makes it easier to control widgets in Genesis conditionally and offers various control over a content, Widget, and shortcode. Snippets should be added in functions.php file of your child theme and most of the new users wrongly paste the snippets or not able to make some little changes and so I recommend you to use a Grandchild plugin or BloxWP addon Sandbox which offers the alternative option of functions.php file where you can test PHP code snippets. The first method is simple as we are using the plugin and so we are using the snippet method to show widgets in Genesis conditionally. Here ‘same-id‘ will be a widget id to identify the widget and to work a specific function for that particular widget. It should be same in both the step1,2. And you that function name should be same too. The hook position could be changed with the help of Genesis Hooks and we can use different conditional tags to create a custom widget with different conditions. Replace the Step 2 with this one.
! is_user_logged_in() = include a space between ! and condition. This makes sure that the work is done for logged in user only. !is_user_logged_in() = ! is with condition. This makes sure that the work will not be done for the logged in user. But will be done for logout user i.e non-registered users. This simply means left the tag which is with me(!) and do the work for others. This way we can show specific widget for logged or non-logged users in WordPress site. Here are some of the more popular widget options using Conditional tags. for both Frontpage and Post page written here or use it. This will enable on Default and Custom Post Type archive. Let me know if you are having any problem working with these snippets. Conditional Tag is_front_page() v/s is_home(). What to use?